Sometimes Paul and I walk the dogs along the local bike trail near our house. As we stroll along the paved walkways, we look into the woods on either side. Because this is New England, we see beautiful tall pines interspersed with old oak, sturdy maples and young birches. We often come across stone walls, covered in moss and lichen, fallen down in places. We know that these walls mark the boundaries of farms long gone. We realize that farmers lived here a hundred or more years ago, and that they cleared this rocky land for their crops, using the upturned stones to build boundary walls that marked their fields. But what intrigues me more than anything else on our woodland ramblings is the sight of huge old overgrown lilacs, standing some ten feet apart in the middle of the woods. If I look closely, I can usually make out the slightly sunken rectangle that would have once marked a front door. Sometimes I am able to move aside the grasses and weeds to find a little cluster of daffodils or day lilies. Sometimes we can see the shape of the root cellar that once stood in this place. I love the way the lilacs stand as sentinels, so many years after the houses have fallen back into the earth. I love the way they continue to blossom and bloom and perfume the air, not caring about whether or not there are humans around to appreciate their beauty. But every time we stumble upon one of these grand old plantings, I wonder, “Who planted these beautiful bushes? Whose house once stood here?” And I fall into daydreams, wondering about those long ago families, living in this place where I now walk. About fifteen years ago, I planted a tiny lilac just outside my front door. It was a baby offshoot of a lovely bush growing in the yard of one of my old friends. Her home was older than ours, and the lilac had been there, full and mature and proud, when she and her husband had moved in. Knowing that we were living in a wild and desolate yard, in a new house, she gave me the gift of that baby lilac, and I put it in the ground with high hopes. Some five years later, that new plant sent out another shoot, which I planted to the left of my door. And now the air outside my windows is filled with the impossibly lavish scent of lilac. The bushes are tall and strong, and fertile beyond my wildest hopes. And as I sit here tonight, in my poorly built house, looking at the cracks in the walls and noting the buckling foundation, it occurs to me that someday in the not-too-distant future, long after this modest home has fallen back into the earth, another couple might come walking along in the woods. They might pause for a moment as their dogs sniff the fallen leaves. They might look into the growth of young maples and birches, and notice the strong and sturdy lilacs that stand side by side, their branches drooping with blooms. I enjoyed this . . . . and it will make me read Whitman’s “When Lilacs Last in the Dooryard Bloom’d” again. Thanks Karen. Thank YOU, Lynda! I don’t know that poem, but will look for it right now. Lovely, Moms. I too love Lilacs. I grew up in an old Victorian house that had lilacs on two sides. Even though we have them here in Virginia, lilacs mean New England to me. and Hisotry! Me, too. There are places around here where you just stumble upon a huge lilac, deep in the woods, and you just know that someone planted it years and years ago. 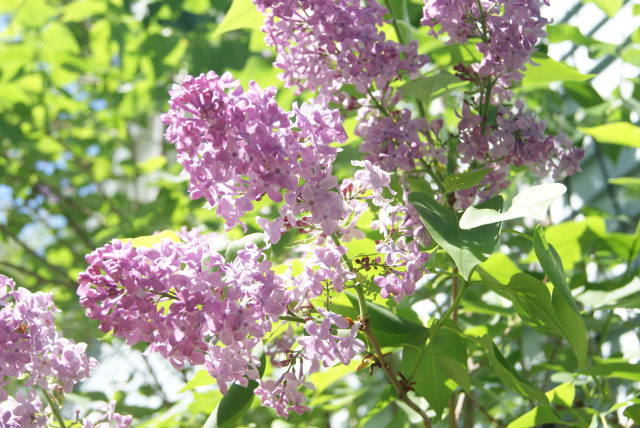 I love the sweetness of that fact, somehow; that the lilac just goes on and on…. Beautiful story, thank you! Very vivid. I, too, often wonder about the women who walked before us. I love how you phrased that! “The women who walked before us.” There are certain rituals, like planting the squash, that make me think those thoughts, too. And cutting my lilacs always makes me think of the women who first settled around here. Lilacs have been my favorite since I was a little girl. Looking forward to having many of them in NH. The one bush I have here is pretty pathetic, just a few sprigs each year and not much scent. Oh, wait till you get back here! The whole world smells like heave right now, with the lilacs and lily of the valley both in bloom! You sound much happier than when you were writing about snow! They smell so intoxicating that they almost make me dizzy! And part of the pleasure is that they bloom for such a short time; they force me to live in the moment, you know? I replanted a l lilac by my house five years ago when we put on an addition. It never took to where it replanted and I associated it’s lack of bloom with my life which wasn’t going as planned at the time. This past weekend I was out weeding and noticed 5 blooms at the very top of the bush. Obviously the spot is too shady and just this year it’s tall enough for some branches to have gotten sunlight and bloomed. I felt so much hope as I cut the blooms immediately to enjoy inside. No, I haven’t won the lottery or gotten a note that my book was accepted for publication but the feeling of hope has made my week. Lovely thoughts in your post. I have always been told that lilacs won’t bloom for 5-7 years after planting; could that be why yours didn’t? The ones that I see in the woods are mostly living in a pretty shady place. I don’t know, but I love the idea of how hopeful they are! I love lilacs too. They remind me of my childhood home where we had an entire hedgerow of them. Thanks for stirring that memory! Thank you! That is exactly how I see them, loyal and true, standing guard although no one is there. That may be the loveliest comment I have ever seen. Namaste to you as well. And thank you! I was quite sad when our big lilac area was leveled. But Doug saved some and replanted and I can happily say they are now thriving! There a bit far from the house but I cut some yesterday and now the kitchen smells lovely! Great post! Yet another reason why I love lilacs and rhodies: you really can’t kill them!